The power of the hashtag is to bring to the conversation what is missing from the conversation. 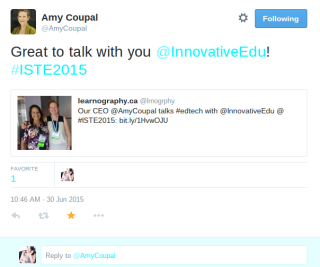 That is what I discussed with Amy Coupal CEO of Learnographyat ISTE in Philadelphia. Amy asked me what was missing from the conversation at ISTE and I realized that with hashtags we can include whatever it is we feel is missing from a conversation. For example, during the opening keynote, @soledadobrienshowed a clip from a school that did not offer classes such as calculus required by some college programs. A student was able to get the class added to the school's offerings, but ultimately, nearly all the students dropped out. What wasn't addressed is that this class looked extremely boring and there was no technology. It was not a place I could imagine anyone would choose to be. In short, what I wanted to add to the conversation, was that it is not enough to offer a class. We have to offer classes that make kids want to be there. Because I am Twitterate, I used the appropriate hashtag, my thoughts were heard, and I became a part of the conversation (you can see one such conversation here). Gone are the days when we can gripe about a conference, news program, or really anything, missing the mark. With hashtags we can contribute to the solution. Hashtags allow us to enlist the talent and ideas of a global community. That is of course if you have, and share, a hashtag. Whether you are running a conference, a school, or a business, hashtags are indeed the magic bullet to bring the community into the conversation. You can watch our conversation in the 90 second video below.